The photo below was taken late in the afternoon while doing some geological tourism at the Grand Canyon in Arizona, USA. The light at this time of day is ideal for such locations as it has a yellow quality and the low sun angle emphasises the contours of the land. I was on a flying visit in connection with the South-Central Regional Meeting of the Geological Society of America (held in Austin Texas). I attended this meeting because it contained a special session in honour of the work of the late Bruce Chappell and the late Alan White – two giants of late 20th century granite geology. This has nothing to do with the visit to the Grand Canyon, and even less to do with the processes that sculpted the landforms depicted. I am not a geomorphologist, but while walking along the canyon’s south rim this feature – way down towards the bottom of the inner canyon – caught my eye. Here lies the Middle Cambrian Bright Angel Shale, a variably coloured sequence of relatively soft sedimentary rocks. This lies above the more recrystallised Proterozoic rocks of the Grand Canyon Supergroup, which provide a relatively hard and stable base for the shale. Above the shale, the rocks have been stripped off by mass wasting and water erosion, leaving this vulnerable sequence exposed to the elements. There are few hard layers amongst the shale, so rain storms and snow-melt from higher altitudes combine with the desert wind to efficiently carve its shape. The shale’s remains are then washed into the inner canyon for transport down the Colorado River. In the photograph you can see a hiking trail disappearing off the edge of the inner canyon and heading steeply down to the river, through the Palaeoproterozoic regional metamorphic rocks of the Vishnu Schist. 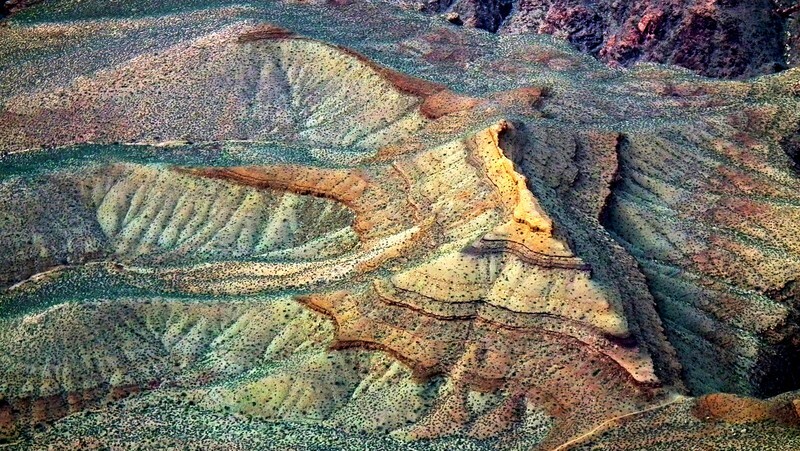 The erosional remnant of the Bright Angel Shale has been saved (temporarily) from destruction by the presence of the slightly harder brownish layers that you can see in the image. Nevertheless, the feature is not long for this world. The harder layers that give the spider-like shape to the outcrop are nearly gone and the ridge at the top is just a narrow remnant of what was once a more extensive butte. The numerous ephemeral streams that are responsible for the canyon’s destruction are clearly visible. There terrain is decorated by only a few small green desert shrubs, which offer scant resistance to the erosion that will eventually obliterate this fantastic feature. Since this image was captured, I have invested in some higher-quality camera equipment and have taken up high-dynamic-range (HDR) photography. Readers interested to see some of these images, including some taken during the meeting in Vienna, can have a look here. Imaggeo is the EGU’s open access geosciences image repository. Photos uploaded to Imaggeo can be used by scientists, the press and the public provided the original author is credited. Photographers also retain full rights of use, as Imaggeo images are licensed and distributed by the EGU under a Creative Commons licence. You can submit your photos here. Extreme weather events, like catastrophic floods, are the malicious exclamation points of Earth’s chaotic and variable climate system; they arrive without warning and extract huge costs, both economic and humanitarian, from the communities they strike. Evidence suggests the frequency and severity of these events may be on the rise in a changing climate, but scientists struggle to place modern events in a longer historical context. Information about the past hides in all kinds of places. The trick is figuring out how to extract it. 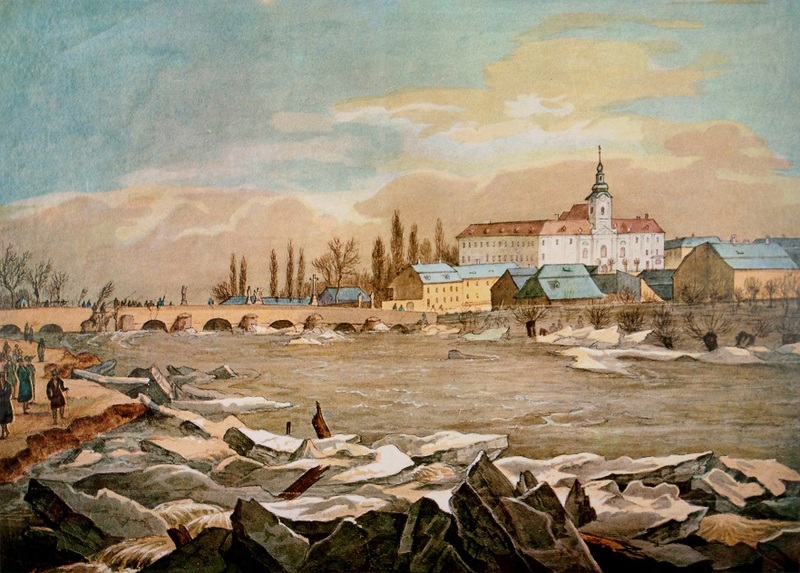 Rudolf Brázdil and his team from Masaryk University in Brno have started using historical tax records from southern Moravia in the Czech Republic to reconstruct the flood history of the area, a test case for broader studies of this kind. At the EGU General Assembly, Brázdil sat down with Julia Rosen to explain his approach. To start with, how did this idea occur to you? Existing hydrological series based on instrumental records are generally short. To study really disastrous events, which have a long recurrence interval, you cannot use just the period of hydrological measurements, you have to extend it into the past. We are working in the field of historical hydrology using documentary sources to reconstruct past floods and we recognised that we can use this so-called taxation data. In the past, in Moravia, if anybody was affected by any disastrous events – like a flood – they had the opportunity to ask to pay lower taxes. It was a complicated administrative process, and we are studying documents related to this process to reconstruct hydrometeorological events – including floods. The idea is to obtain the longest series of extremes as possible. How do you actually infer flood histories from these data? Using this data, you can recognise the time and place of an event and its impacts. That’s because the original aim of these documents was to describe damage for which affected people could obtain some tax relief. Generally, you can use flood marks to determine the size of events. For example, people identified the height of the water on the bridge, or on the wall of the house. In Prague (where I have worked before) there is a statue – the head of a bearded man – that was installed in the 15th century. People have characterised floods with respect to how much of the head was submerged, or if it disappeared entirely, since 1481. People knew, for example, that if the water reached the head, they had to leave their houses. You also know the flooded area by which villages or settlements have been affected. It is difficult to precisely compare the magnitude of historical floods with recent floods because of the totally different character of rivers in the past. They were not regulated – they had many meanders and the character of the landscape was different as well. But we can still compare events from the point of view of the frequency of floods, their seasonality and impacts. What are the challenges of working with this kind of data? What are its limits? Every proxy is limited from different points of view. One limitation of our data is incompleteness, both spatially and temporally. For example, you could have a situation where nobody recorded such events, although this is not so likely when events are really strong. Second, perhaps someone recorded it, but original records were lost in fires or during reorganisation of archives. Third, of course, it is generally qualitative information. You need to understand the nature of these data by collaborating with historians and archivists. I am a climatologist, and for me, it’s extremely important to cooperate with such people because without them, there wouldn’t be any historical hydrology. On the other, they would never use such data for the purposes for which we are using it. It is a classic example of interdisciplinary research. What did you find? Has the frequency of extreme floods increased or decreased? 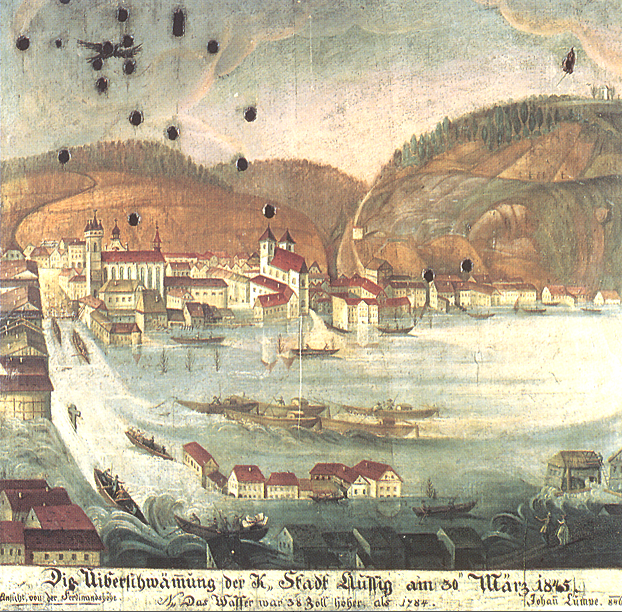 We are more or less at the beginning of this project using taxation records in Moravia. I am just now evaluating everything, so it’s difficult for me to say now. However, I can give you an example from Bohemia (the western part of the Czech Republic) where we have worked before using other kinds of documents. There, the 19th century was an extremely active period for floods, followed by the second part of the 16th century. The second part of the 20th century was very quiet in the Czech Lands, there were really no important floods until the disastrous floods of July 1997 in Moravia and August 2002, in Bohemia. For this project, the first step was tax records. The second step is family archives, which sometimes contain better information, and the third step is chronicles, then newspapers, and of course systematic hydrologic and meteorological measurements. This should form the main database to allow us to do our analysis and synthesis. Success will be if we are able to analyse in detail the spatial and temporal variability of hydrometeorological extremes for the last 350 or 400 years and to use this information for estimates of future extremes. It will also be a success for us if our work gains acceptance within the international community. This will demonstrate that we are presenting new and interesting results and new methodological approaches that might be applicable on a broader scale. I believe these taxation data are available in many European countries and it would help to extend our knowledge about past floods in this area. The project is financed by the Czech Republic Grant Agency. We are currently changing our planet like never before. But do these changes deserve a new name? The Anthropocene – a geological period marking the length of time for which humans have had a significant impact on the planet – was first proposed in the 1980s. But the word has gained significant attention in recent years thanks to the popularising work of Nobel prize-winning chemist Paul Crutzen. Humans are now responsible for moving more sediment around the face of the planet than all natural processes put together. Species extinction is thought to be operating at between 100 and 1000 times the ordinary background rate. Trace elements from weapons tests and coal burning can be found in ice cores. And climate change is altering the planet’s ecosystems in numerous ways. Yet despite all this, the Anthropocene isn’t officially recognised by geologists. The International Union of Geological Sciences (IUGS) is the body responsible for changes to the geological timescale. Back in 2008 they acknowledged that the term had merit and in 2009 they set up a working group to investigate the issue. Jan Zalasiewicz, a Senior Lecturer in Palaeobiology at the University of Leicester in the UK, is a member of the group. “We make the decision to mark out the great dynasties,” says Zalasiewicz, “and we are now in a new dynasty.” Zalasiewicz was speaking at a press conference at the EGU General Assembly 2014. But the process remains a slow one: the working group isn’t presenting its initial findings until 2016. The issue explains Tony Brown, Professor of Geography at the University of Southampton in the UK, is that we need to be able to find the Anthropocene in the rock record; we need to be able to show that Anthropocene deposits extend for large horizontal distances and we need to be sure that they’ll remain there in the future. The other major concern is when the Anthropocene actually started. “There’s probably a consensus that this is worth formalising,” says Zalasiewicz, “there’s less of a consensus as to when that should be.” Some, like Crutzen, pin the boundary at the start of the Industrial Revolution, but others think there is evidence for a much earlier start to the Anthropocene around 8000 years ago, when human agriculture first became widespread. Perhaps, then, the Anthropocene is most useful as a tool for engagement, a way of reminding people how much of an effect we have on the planet – and that we need to think carefully about how we should be living in the age of humans. Every travel opportunity is a chance to capture something beautiful on camera, whether it’s a marbled road-cut as you pause on a long journey, a look up through the trees on your way to work, or a glimpse at the land below as you fly to a far-flung location. The latter is what led Matthias Buschmann, a PhD candidate from the University of Bremen, to steal a few seconds of stunning Svalbardscape on camera. Twice a week a small passenger plane brings cargo and keen scientists to the remote village of Ny Ålesund, Svalbard. On a mission to measure atmospheric trace gases from a joint French-German research base (AWIPEV), Buschmann stepped aboard, ready to capture data for a number of global atmospheric projects (the Total Column Observing Network and the Network for the Detection of Atmospheric Composition Change), but that wasn’t all he captured on the trip. 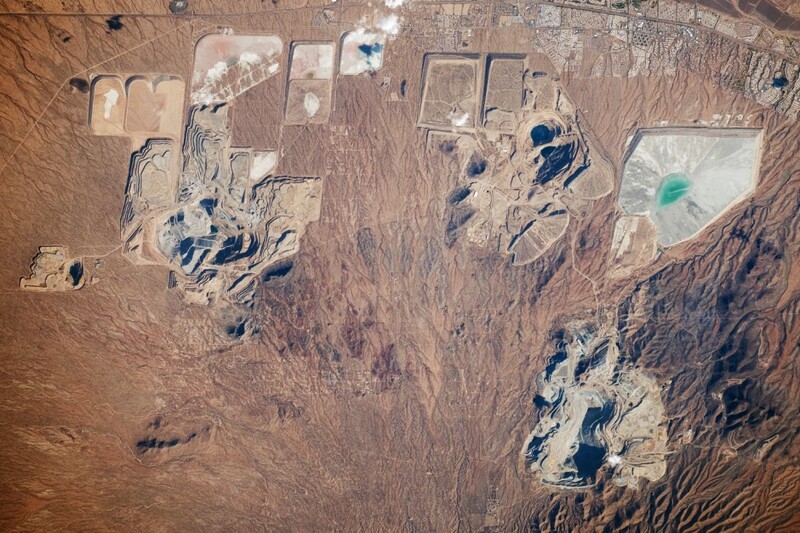 Buschmann directed his camera out to the scene below, hit record, and – voila! – One lovely landscape for other eyes to see. He describes the scene: “Looking in north-eastern direction, the flight in this clip covers the outskirts of Ekmanfjorden, a northern branch of Isfjorden. The glacier we see beneath is called Sefströmbreen and, finally, the mountain range Palatiumfjellet with its Svalbard-characteristic shapes. We were really lucky to have such great weather after a couple of rather cloudy days”.